A fascinating flower, Carnation Green Trick has become a florists favourite, and yes it is available for you to grow in the garden. seen as a ‘novelty’ flower, its popularity makes it more than that. Dianthus barbatus ‘ Green Trick’ was developed in Holland and is related to the well known carnations seen in florist shops. 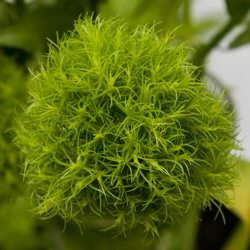 Developed by the Dutch plant breeder Hilverda Green Trick Carnation is a fascinating plant, lime green ‘Ball Like’ flowers 8-10cm in diameter. As far as we can work out Green trick is not scented, it will grow in similar conditions to regular carnations and dianthus, and has long lasting flowers. Great as a cut flower and a stunner in the garden. A few other plants with green flowers are around, however none with the vivid grass green of the ball shaped flowers of this plant. If you are wondering how to grow Green Trick, its the same as any of the Dianthus, perhaps with just a little more care. You will need a humus rich soil, well drained and a sunny protected position to grow Green Trick. You will be growing them from plugs or tube stock, they do not come true from seed. Once planted, water in well with a liquid seaweed fertiliser and weed around the plants to remove competition. Take care to keep snails and slugs away as well.